Media Type: This drop down will contain the Media Type chosen while creating the campaign originally. Depending on your settings, this can be changed by selecting a different Media Type from the drop down. 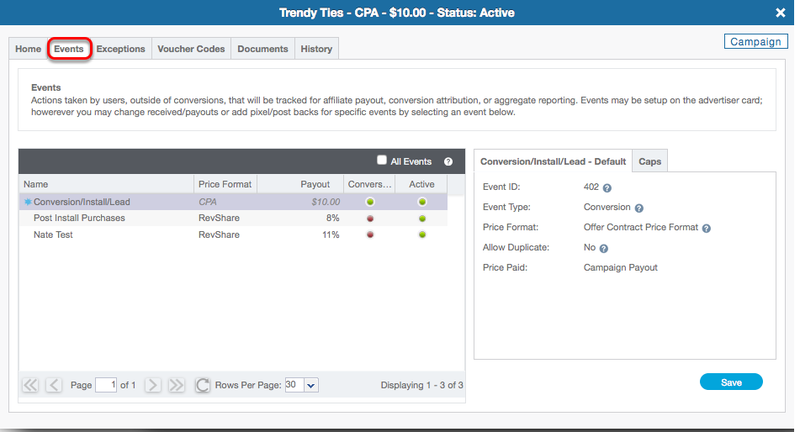 Payout: The payout field defines how much the affiliate is receiving per conversion (or click if the Offer is a CPC). This can be changed at any time, and the change will be made in real time. 3rd Party Name: Third Party Name allows you to associate a different name to the campaign. This feature is not on by default, and is enabled on an as needed basis. Please consult your Account Manager for more information on 3rd Party Names. Notes: Clicking the edit notes hyperlink will direct you to the History tab where you'll be able to add notes to the Campaign card. 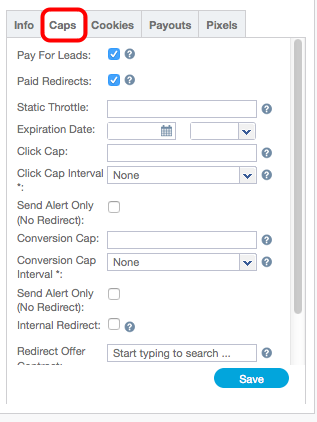 Pay For Leads: By default this feature is enabled. 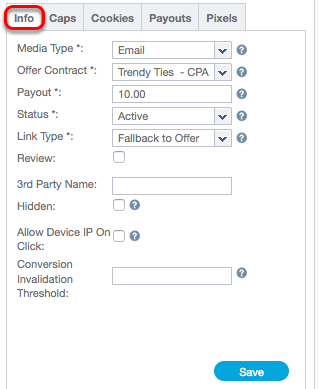 This allows for conversions to result in the payment to the affiliate and for their conversion pixel to fire. This can be unchecked at any time. Paid Redirects: By default this feature is enabled. 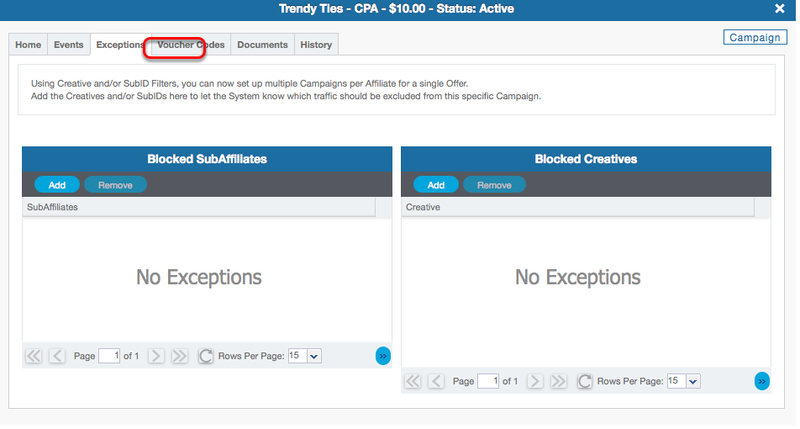 In an offer or vertical redirect situation, CAKE will auto create a campaign for the affiliate if one does not exist for the offer. If the redirect results in a conversion the affiliate will receive payment. This can be unchecked at any time. 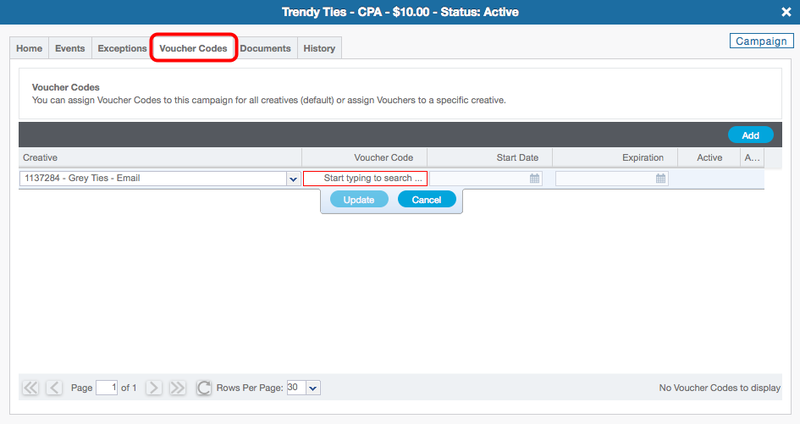 Expiration Date: Allows a user to set a specific date and time when the campaign will expire. Once the campaign expires the affiliate's traffic will redirect to the campaign redirect, offer redirect, vertical redirect or global redirect depending on settings in place. Click Cap Interval: From this drop down you are selecting the interval for which you are setting the click cap. Daily, Weekly, Monthly or Custom. Conversion Cap Interval: From this drop down you are selecting the interval for which you are setting the conversion cap. Daily, Weekly, Monthly or Custom. Redirect 404: Having this checkbox checked will redirect traffic to a 404 page if a click or conversion cap is hit. Auto Disposition: (To be used with Pending Conversions only.) which CAKE will auto approve conversions. Redirect Domain: If you have redirect domains enabled you will be able to choose from them in this drop down. Please consult your Account Manager for more information on redirect domains. 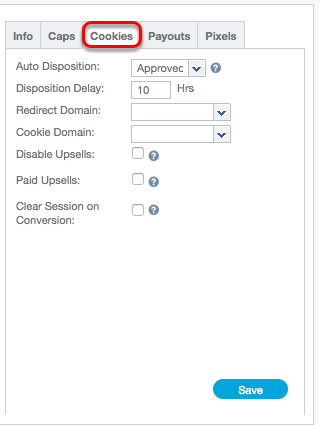 Cookie Domain: If you have alternate cookie domains enabled you will be able to choose from them in this drop down. Please consult your Account Manager for more information on alternate cookie domains. Disable Upsells: This sets whether this campaign will show or not show upsells on the offer's thank you page and redirect returning users upon previous conversions. Paid Upsells: When enabled, this allows upsell traffic to result in payment for this traffic. Note that paid upsells will auto create campaigns. When disabled, affiliates will not be paid for upsell traffic, therefore not auto creating campaigns. Clear Session on Conversion: Having this checkbox checked will clear a user's cookies once they convert, thus allowing them to convert over and over on this campaign. 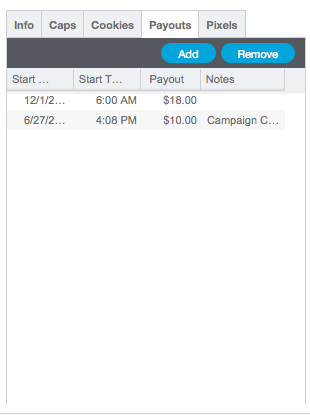 The Payouts tab allows you to make scheduled price changes for the payout amount. These scheduled changes will take place at a future date that you select. 2. Choose the Start Date and Start Time for when you would like this change to take place. 3. Set the new payout amount, put in any additional notes regarding why you're making this change and click Update. For more information on the Payouts tab please see the document on Future Dated Payouts. Test Link: The Test Link field allows a user to place a specific link that the affiliate has provided for the purpose of testing. 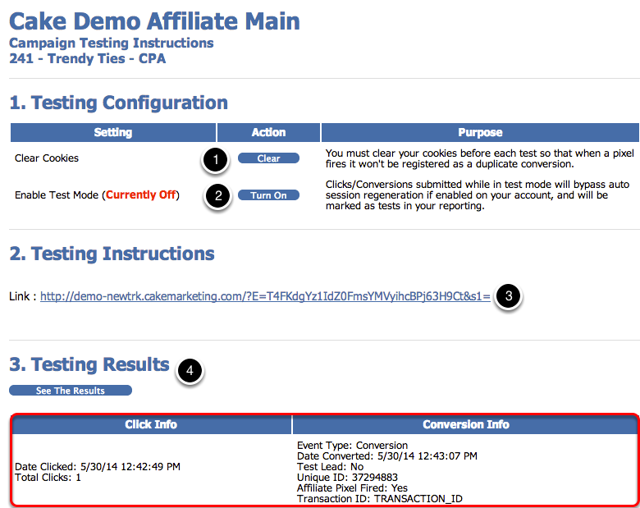 The affiliates test link would override the test link already present on the testing page. The test link will redirect through the CAKE unique link. Unique Key Hash Type: From this drop down please specify the hash type the affiliate is using on Device IDs. On step 2 the link will be displayed next to 'Unique Link'. 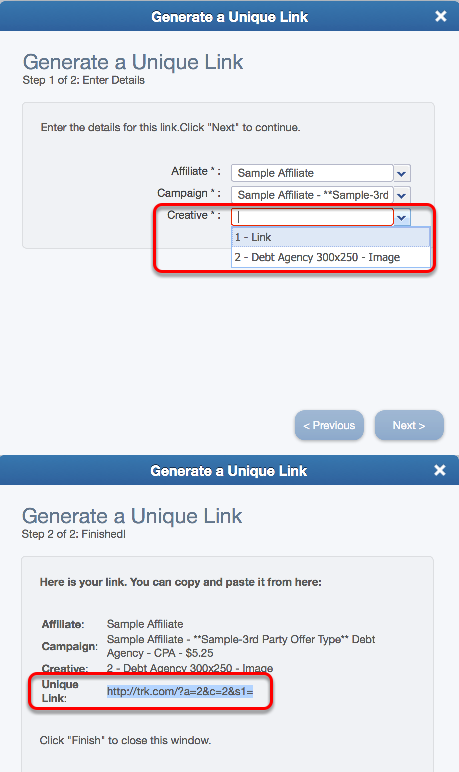 The link is composed of your tracking domain, the affiliate's ID, and the creative ID. Clicking on the Send Creatives button will bring you to the send creative wizard. Contact: Select the contact you are wanting to send the creatives to, or choose all contacts to send the creatives to all contacts associated with this affiliate. 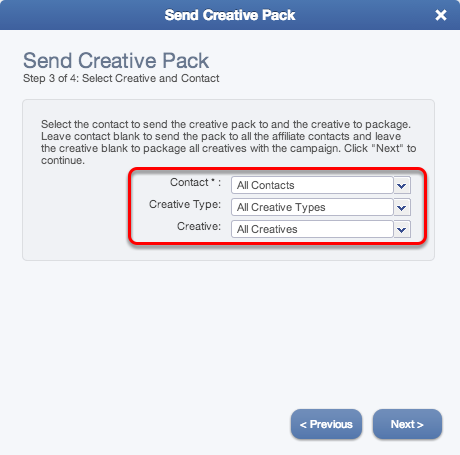 Creative: Select the actual creative you are wanting to send, or choose all creatives to send everything. Once done click Next for a summary page, and Finish to send out the creatives from your global email address. 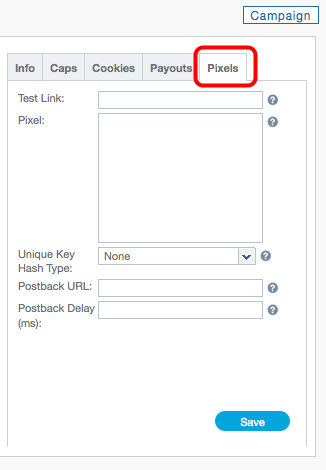 Clicking the Test Campaign button will open a new browser window where you can test the campaign to ensure the conversion pixel is placed properly, and that CAKE is tracking a click and conversion. 4. Clicking the button See The Results, where you will then see the click and conversion information. 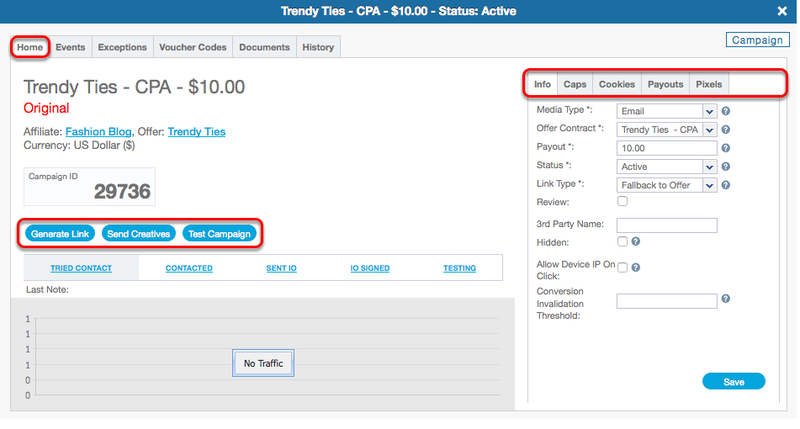 This will show you a date and time stamp for both your click and conversion, and will also alert you to wether or not your affiliate's pixel fired as well. Events is a feature that is not enabled by default. 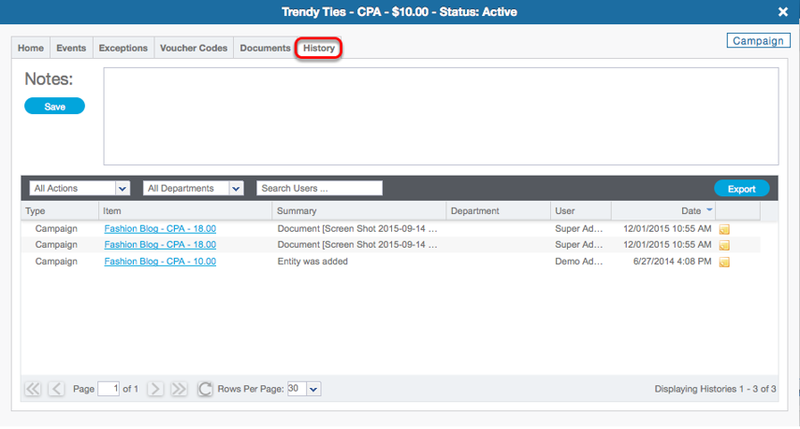 If Events is enabled, the Events tab will display all events that have been set for the offer. From here, you can make specific edits for this campaign. For a complete overview of how to setup Events, please see the Event Settings from our "How to Track Events" article by clicking here. Blocked Subaffiliates: This widget allows a user to either add or remove subIDs. Traffic to the campaign with a value in the s1 parameter of the unique link that matches a value in this widget will redirect to the global redirect. Only available to those CAKE clients who are leveraging eCommerce license add on. Please see Voucher Code Documentation for more information. 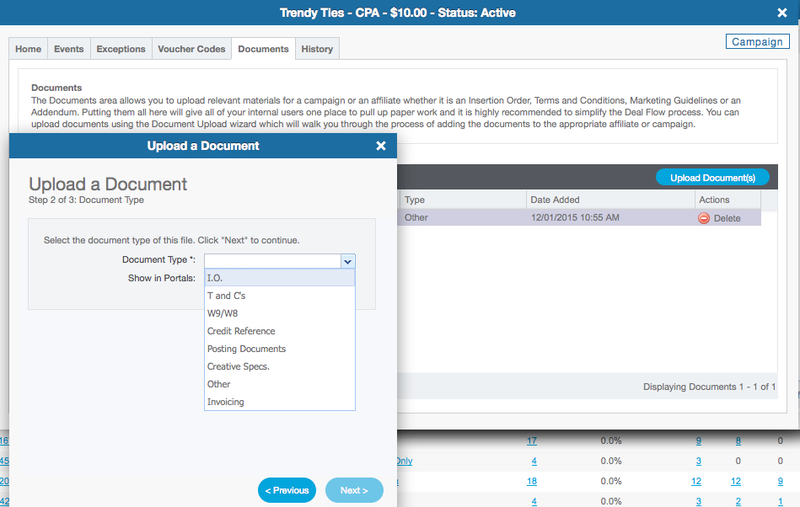 The Documents tab allows a user to upload documents specific to this campaign. To add a document click the Upload Document button > select the type of document you are looking to upload. Then click Add File and select the file from your hardrive. Once you've selected your file click the Upload Files button and then Finish.